As the years have passed, we have seen how Urban Initiatives has grown remarkably. In that growth, we have gained an abundance of amazing coaches, including this dynamic trio at Daley Academy. Martina G. Arellano, Rosa M. Cervantes, and Maria L. Salazar, have all shown true passion for Urban Initiatives programs at their school. Coach Martina, Coach Rosa, and Coach Maria, all started coaching 10 years ago, when their kids first joined the Work to Play program. Now that their children have long since graduated from Daley Academy and are now in high school and college, each of these Coaches decided to stay involved at their neighborhood school. When given the opportunity each Coach speaks about the importance of Urban Initiatives not only at their school but also in their community. “Because the kids are not in the street. It’s helping the students become responsible, because if they are not doing well in school, they cannot be in the program.” Coach Rosa states why she thinks the program is important to the Back of the Yards community. At Urban Initiatives, we advocate for our students to excel not only on the field or playground during program sessions, but in the classroom as well. In our Work to Play program, players are scored on a scale of 1-3 weekly to see how they are doing in the classroom, as far as turning in homework, classroom participation, peer respect, and teacher respect. As Urban Initiatives continues to grow, we hope to continue to inspire our program participants to better themselves and to continue to unite with students across different Chicago communities. We also want to give a special shout out to these three terrific coaches who have continually helped inspire students everyday for the last 10 years. 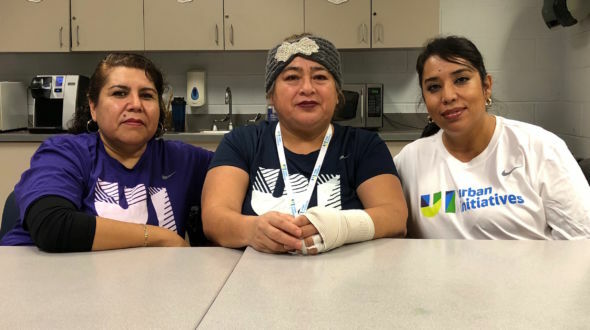 Thank you, Martina, Rosa, and Maria, for being truly committed coaches to every UI student athlete at Daley Academy and at all our partner schools.